People love to share interesting emails with their friends. Don't you. But all they do a most common mistake. 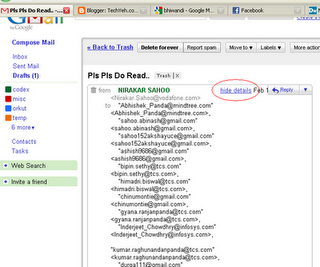 All the those at the receiving end easily see other email id those of common friends and many stranger ids. Here comes my work. You can extract all these emails and grow our friend list rapidly in facebook, twitter, orkut, or can invite them to take a glance on your website. There is no perfect software to catch these contacts automatically. 4. Open a new text document and paste their from clip board. And you are done. 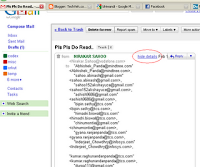 Your file is ready to upload to your email address book/facebook/outlook or to any other application. This trick can also be performed for converting .txt contacts files (extracted from any other source) to .csv contact files. To save your friends to being spammed like this way use the BCC option while sending emails to many people and ask them to do so. Extracting email ids from embedded forwarded mail. 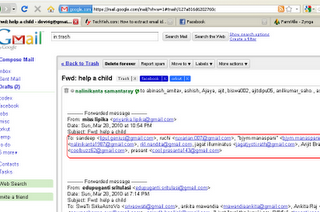 1.Press and hold control key and select all emails and names that are showing up inside the mail. 2.Open a new word document and paste from clip board. enter in find field ","
4.Replace all "5.Replace all ">" with ","
8.Save file as something.csv (chose all file types).